Sailing is a “members only” kind of sport. Fact: Exclusive, private yacht clubs do exist, but so do public community sailing centers and neighborhood sailing clubs that welcome new members. You can sail your whole life without belonging to a club. Sailing is hard to begin as an adult. Fact: Sailing tends to be passed down through families, so there are many sailors out there who started young. But the skills required to sail a boat are not age-specific or hard to acquire. Many people learn to sail in their 30s, 40s, 50s, and 60s. Call a sailing school and ask the average age of its clients. You may be pleasantly surprised. Fact: Sailing can be expensive, but it does not have to be. 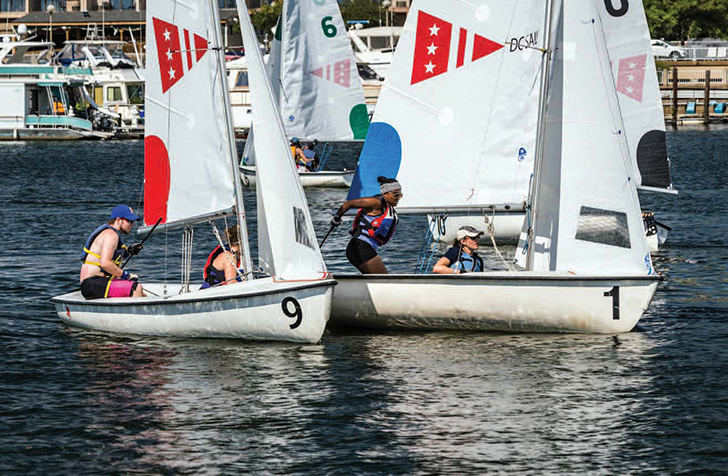 Community sailing programs offer reasonably priced learn-to-sail programs, public sails for those who want to try the sport, and membership options. Many sailing programs offer reasonably priced boat rentals, boat share opportunities, or free crew options. You need to own a boat to sail. Fact: See #3. There is an expression in the world of sailing: OPB. Other People’s Boats. Everyone who owns a boat seeks crew to help him or her sail. That crew could be you. If you find a sailing school, a community program, or a club, you will find boat owners seeking crew members for their boats. Those who are interested in racing boats and are willing to show up and learn will always have opportunities to sail ever owning a boat. Start Sailing Now was created to demystify sailing and show you just how easy it is to try. We address the most confusing topics for new sailors: nautical language, what to look for in a sailing school, what to wear, how to try the sport for free, insider tips from longtime sailors, information on kids’ programs, and a bit about sailing with family. Read on. Sail on. Welcome to sailing!